After our post on 3G (third generation) football pitches earlier this week, we thought we’d take a look at artificial hockey pitches. Artificial turf has many advantages over natural grass in terms of performance and practicality for Hockey facilities. 3G surfaces offer enhanced speed, movement and ball predictability. They are resistant to wear in all weathers, allowing for play all year round. Pitches also require considerably less maintenance, saving facilities time, money and inconvenience. While there are a multitude of benefits; it is crucial to get the right product. For example, a water-based turf enables faster ball transfer than a traditional sand surface, making it the product of choice for league competitions. The turf is also less abrasive; therefore reducing player injuries to skin. When it comes to the installation, there are many things to consider; the drainage system, the need for irrigation, the type of base and sub-base. Seeking advice from a qualified professional will ensure the success of your new pitch. Leisure Tech Lawns have a wealth of experience in this area. The picture (above) is a replica of the Olympic Hockey Stadium that we fitted in Loughton, Essex. We also installed the water based Olympic Hockey Pitch in Lillyshall. If you need any help, don’t hesitate to contact us – email your questions to enquiries@leisuretechgb.co.uk or call us on 01371 87 5901. 3G is short for third generation, an enhanced football pitch with an artificial grass surface. Astroturf has many advantages, the ability to play in all weathers, no wear and tear and no maintenance. It is ideal for community pitches, schools and grass roots clubs because the surface allows for training and play, all year round. Facilities are able to save money on costly maintenance – pitch mowing, feeding, draining and watering. They also save themselves the inconvenience of having to cancel winter matches due to freezing conditions. October through to February is a lottery for struggling clubs. With extensive flooding throughout the summer too, they end of with a backlog of fixtures. A 3G pitch can offer a new lease of life. Fake grass has come a very long way since it’s advent in the 1960’s. Advances in technology means fibres are softer and non-abrasive; your skin won’t get burnt during a sliding tackle. It in fact offers maximum comfort and enhanced play including great ball bounce, roll characteristics and control. Most can be used with rubber studs too. Leisure Tech Lawns are happy to help too. We’ve installed astro-turf for clubs, schools and communities throughout Essex. Our products have been rigorously tested to meet requirements. The above photo is a full-size pitch install we recently completed in Dartford. Call us for free advice on 01371 87 5901. This lounge area looks so inviting with the fresh, fake grass carpet. Natural bamboo furniture, crisp white cushions and potted plants enhance the look. The OpenHouse Gallery in Manhattan launched the world’s first indoor pop-up park last year. The public space was enjoyed by thousands. Create your very own meditation room – a space for relaxation and reflection. The natural materials give the space an authentic feel, creating a haven at home. 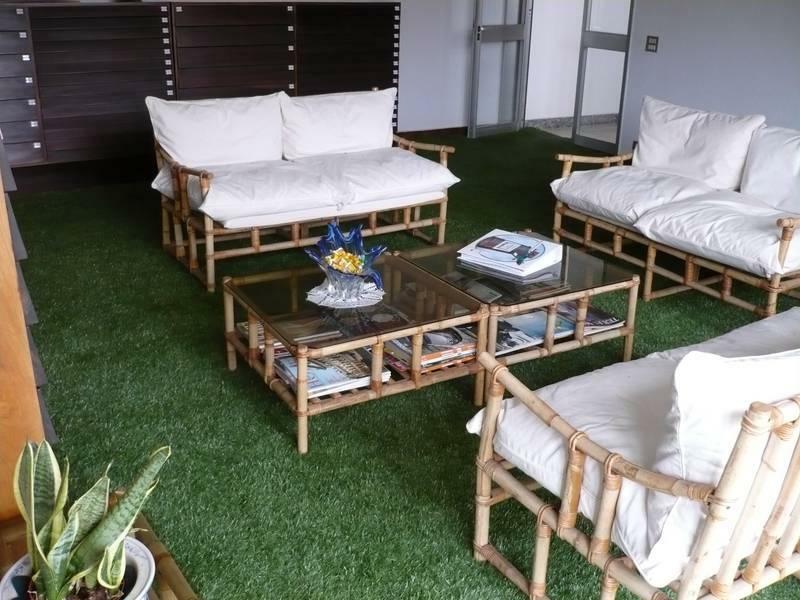 Artificial grass is a growing office interior trend. It can breathe life into a stuffy office building and create the perfect environment for creativity. This is an extension to a villa in Stockholm. The artificial grass connects with the natural grass of the outdoor landscape. The large windows make it seem as if it’s growing through the house. 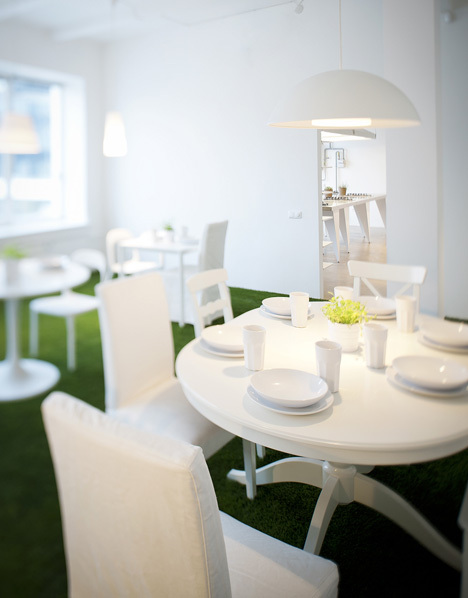 Students at this cooking school in Lithuania sit down to tasting sessions in a dining room carpeted with synthetic turf. They’re encouraged to walk barefoot across the soft grass. Fake grass allows you to create imaginative children’s bedrooms and playrooms. This fun football themed boy’s bedroom allows the lucky lad to sleep on the pitch. Happy New Year from all at Leisure Tech Lawns. Take a look out the window…is the bad British weather ruining your lawn? If so, maybe it’s time to make a change. Consider a brand new artificial grass lawn that looks great all year round, with virtually no maintenance. Winter weather is playing havoc on gardens across the country. Flooding, frost, ice and snow can have an extremely detrimental effect on grass. Icy conditions cause serious grass and soil damage. Lawns become waterlogged when ice melts, then during re-freezing tissue cells rupture. Snow mould is becoming a more frequent problem in the UK. Snow covering prevents air from circulating, allowing the fungus to thrive. This turns grass grey or pink depending on the mould type. Never walk on a frosty lawn – as the frost ruptures, the grass fractures. This will leave unsightly footprints where the grass was damaged, long into the Spring months. If you’re fed up with all these problems, why not make a change for 2013? You can have a brand new lawn installed at an inclusive price of just £45 per sqm. That’s everything…the grass itself, labour, materials and VAT. Artificial grass is indistinguishable from the real thing. In fact, it’s better. No bare, patchy, muddy areas, weeds or moulds…just a fresh, luscious green lawn. It will look immaculate 12 months of the year with none of the hassle. Start your New Year with a new lawn…and free yourself from garden maintenance.